As the United States struggles with an epidemic of opioid use and its devastating effects on lives, society and the economy, it’s important to consider the role massage therapy can play in pain management. Hear from leading experts at the International Massage Therapy Research Conference, as they discuss integrative strategies to address the current opioid crisis, and innovative research on the horizon. Register to secure your spot today! Dr. Kerns is a Professor of Psychiatry, Neurology and Psychology at Yale University. He is currently the Program Director of the Yale-based National Institutes of Health – Department of Defense – Veterans Affairs Pain Management Collaboratory Coordinating Center. 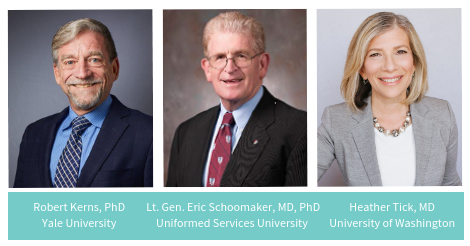 Dr. Schoomaker served as the 42nd Surgeon General of the United States Army and Commanding General, and is the Director of the Uniformed Services University of the Health Sciences (USU) LEAD program. He has been honored with the Order of the Military Medical Merit, the “A” proficiency designator and holds the Expert Field Medical Badge. Dr. Tick is a Clinical Associate Professor in the Departments of Family Medicine, Anesthesiology and Pain Medicine. She is the first Gunn-Loke Endowed Professor of Integrative Pain Medicine at the University of Washington. Dr. Tick also co-founded one of the first interprofessional pain centers, located in Toronto, and is the lead author on Evidence-Based Nonpharmacologic Strategies for Comprehensive Pain Care: The Consortium Pain Task Force White Paper.